Now that the basics of Firebase Analytics have been covered in some detail in the preceding chapters, this chapter will step through the creation of a simple Android application project that demonstrates some of the key features of both the Firebase Analytics library and the screens within the Firebase console. The tutorial will also make use of both the logcat and DebugView debug modes for viewing events and user parameter changes in real-time. The app created in this chapter will use Firebase Analytics to demonstrate the use of events, user properties and audiences. Within the new project dialog, enter Analytics into the Application name field and your domain as the Company Domain setting before clicking on the Next button. On the form factors screen, enable the Phone and Tablet option and set the minimum SDK to API 16: Android 4.1 (Jellybean). Proceed through the screens, requesting the creation of an Empty Activity named AnalyticsActivity with a corresponding layout named activity_analytics. Using the Properties panel, change the text displayed on the two RadioButtons to read “Cash” and “Credit” with IDs set to cashRadio and creditRadio respectively. Next, drag and drop the EditText and Button views onto the layout. Delete the text property for the EditText view, set the hint property to “Item” and change the ID to itemText. Change the text property of the Button to “Order” and configure an onClick method named orderItem. Finally, select all of the widgets in the layout, right-click on the Button and select the Center Horizontally menu option. Repeat this a second time, this time selecting the Center Vertically option. Within Android Studio, select the Tools -> Firebase menu option to display the Firebase assistant panel. Within the assistant, unfold the Analytics section, click on the Log an Analytics event link and connect the project to Firebase using the existing Firebase Examples project. Once the project has connected to Firebase, click on the Add Analytics to your app button and accept the proposed changes in the resulting dialog. The Button widget within the user interface layout is configured to call a method named orderItem() when clicked by the user. The code within the method will identify whether the customer is paying by cash or credit card and extract the ordered item from the EditText widget. An event named item_ordered will then be logged with parameters containing the ordered item and the user’s payment method. A user property named last_ordered will then be used to record the last item ordered by the user. Before testing the app built in this chapter, both the logcat and DebugView debugging modes need to be enabled so that the event logging can be viewed in realtime. User properties are only visible within the Firebase console if they are first declared within the User Properties screen. Navigate to the Firebase console in a browser window, select the Firebase Examples project and, within that project, the Analytics app created in this chapter. If the app is not yet listed, it may be necessary to wait for a few hours before it appears. Compile and run the app on the device or emulator on which the two event debugging modes were enabled. Navigate to the DebugView within the Firebase console Analytics screens and display the logcat panel within the Android Monitor tool window within Android Studio. 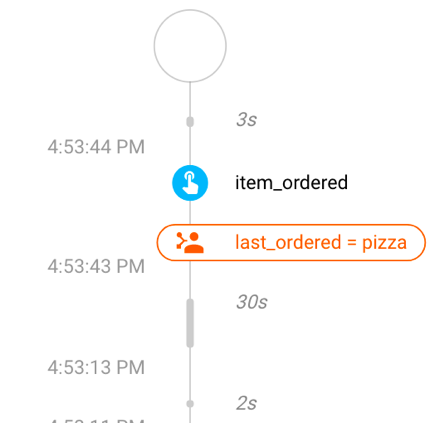 Once both are visible, enter an item name (for example pizza) into the EditText view and tap the Order button. Spend some time interacting with the app, for example moving it between background and foreground and entering different text into the text field. Note that within the DebugView the stream begins to register user_engagement events. This is one of the event types recorded automatically by Firebase Analytics. It can take up to 24 hours for the other screens to begin displaying event information. It should be possible, however, to create an audience using the user property. 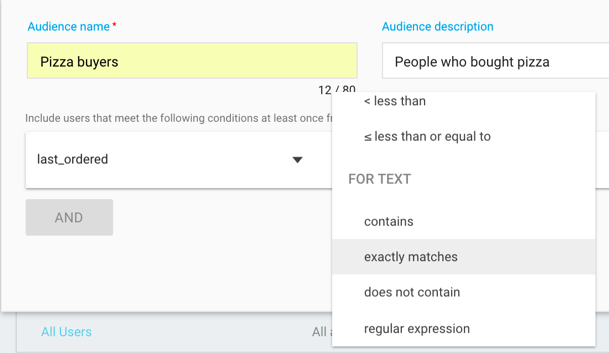 Once created, the audience is available for use when filtering results within the Firebase Analytics screens, and also when targeting users using the Firebase Notifications and Remote Config services. It is also possible to create audiences based on events and parameters (for example an audience could be created containing all users who logged an item_ordered event with the payment method set to cash). Although user properties are available for use with audience creation, it can take up to 24 hours for a custom event type to appear as an option in the audience creation menus. 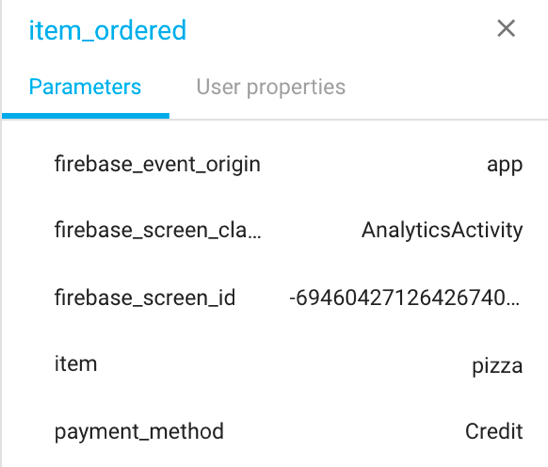 This chapter has demonstrated the use of Firebase Analytics to track events within an Android app. This included the use of custom events and user parameters. The chapter also created an example audience based on a combination of events and user parameters. This page was last modified on 30 August 2017, at 17:54.